The following libraries provide books in languages other than English. Italian: Novels, poetry, plays & other texts, both classic & contemporary, in HTML, for reading online. Over 2000 works of Japanese literature. Formats include: HTML, ZIP, and Japanese e-book. French: 10,000 eBooks (French & Swiss Authors) Literature, philosophy, history, economics, & science, etc. Belarusian literature in Belarusian, with some English, German & other translations. French: Over 2500 digitized works. Portuguese: Over sixty free titles from 26 authors, including José de Alencar, Joaquim Maria Machado de Assis and Afonso Henrique da Lima Barreto. All public domain books or with author permission. Formats include Word, PDF, RTF and Palm PDB. Indian: Over 29,000 books predominantly in Indian languages. Chinese: Electronic library archive of Chinese classic texts. German works with some classic English and Hungarian books also. Formats include: (.pdf), (.prc), (.lit), (.tr), and (HTML) for your Web browser. 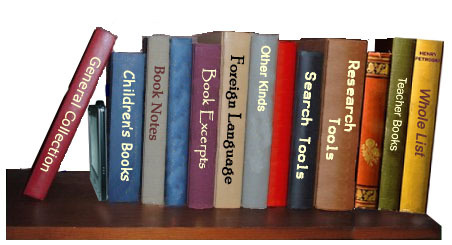 Links to over seventy foreign language libraries with languages ranging from Afghan to Czech, French to Russian, Latin to Yiddish. Classic texts in Italian, English and Latin. Available formats: HTML ; RTF; TXT. books available online here, in both Russian & English in ZIP and HTML formats. Send mail to cavanaugh@drscavanaugh.org with questions or comments about this web site.